Springtime brings with it an explosion of love and joy with brand new life everywhere! Warmer weather, softer colors, flowers budding and greenery everywhere lends to the happiness and rebirth. Spring is also a wonderfully, romantic season to get engaged and plan your beautiful wedding. One of the first things you can plan and design as a couple is your engagement ring. 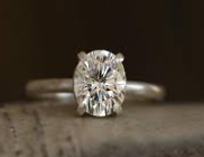 Choosing a stone for your engagement ring is a very personal decision and is different for every bride. There are so many choices for a center stone from colored diamonds to precious stones. There has been a huge swing to individuality lately with opals, emeralds, rubies and sapphires making a statement for your engagement ring. These beautifully colored gems can be set alone or surrounded with diamonds. Then there’s the choice of white gold, yellow gold, platinum or rose gold for the setting. Lately, our gemologist has been working with shafts of beaten gold as well as smooth gold. A lovely touch is to combine the two types of gold, perhaps rose gold and white gold interwoven. Or white gold and yellow gold braided with diamonds on the sides is also a beautiful option. Wedding bands are also a huge part of the design and can be thicker in width or thinner and stacked front and back of the engagement ring. Then there’s the gold finish which could be beaten gold or high shine. 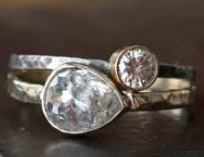 Whatever your preference Andrew’s Jewelry Store in Centennial has an on sight gemologist who has designed engagement and wedding rings for the last 30 years and can make practically any shape. Come in and see the huge selection of diamonds, colored diamonds, precious rubies, emeralds and sapphires we have in store, meet our great ladies and celebrate your upcoming union.